The Museum’s April vacation week theme is “Tell me a Story,” a perfect opportunity to share a story from the collection. With an estimated 50,000 items, the collection holds a treasure trove of stories waiting to be told. Some of these are simple, recounting what is known about a specific item or group of items – who the donor was, what the item is, when it entered the Museum collection, where it came from. 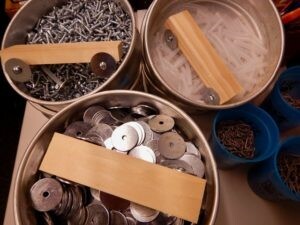 These are always fun stories to share but I love when visitors to storage share their own stories too! Stories of their childhood or family memories inspired by finding a familiar object, stories of past Museum visits, or both. In these moments, I get my own behind-the-scenes glimpse at what makes the Museum’s collection so special. When my children were young, we used to come to the Museum regularly, at least once a month. 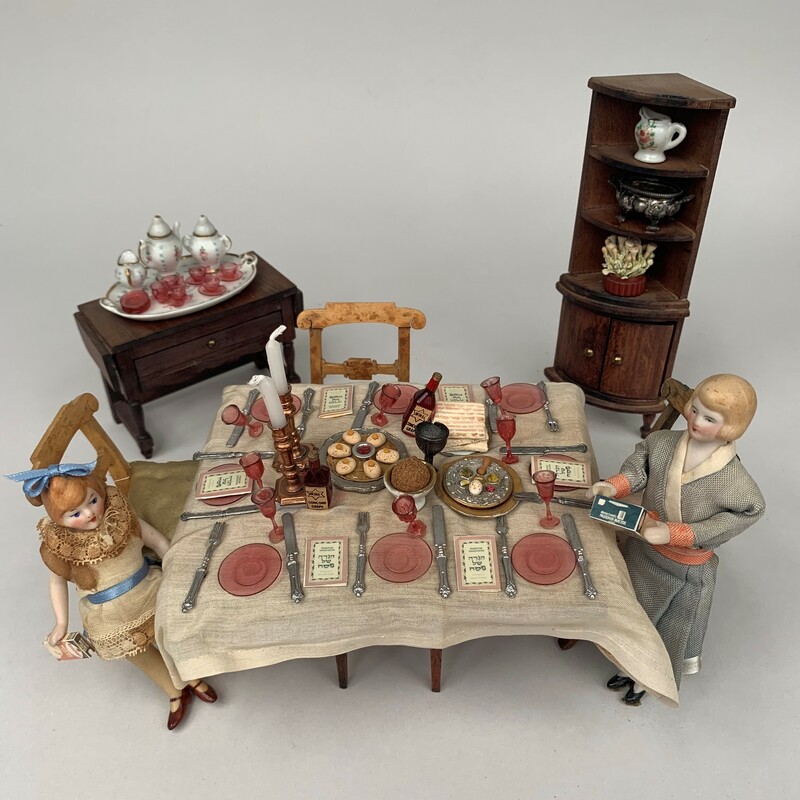 And at some point during our visit, we would always head for the Dollhouse Exhibit, a quiet, darkened, carpeted space full of dollhouses, where you could really relax away from the crowds and immerse yourself in the tiny worlds throughout the room. There was also a wall-based exhibit with cutout Plexiglas windows which allowed visitors to peek into individual family scenes with different set-ups. My absolute favorite was the Jewish family who were celebrating Passover from around the 1930’s. We were coming from a town where we were the only Jewish family I knew of. I frequently felt isolated and my children had some issues with their Jewish identity because it was so different from what was all around us, particularly at holiday times. So, I used to gravitate to this Passover Seder display and just soak in all of the familiar objects and little set-ups, letting the scene fill me with warmth and ages-old support for my identity. 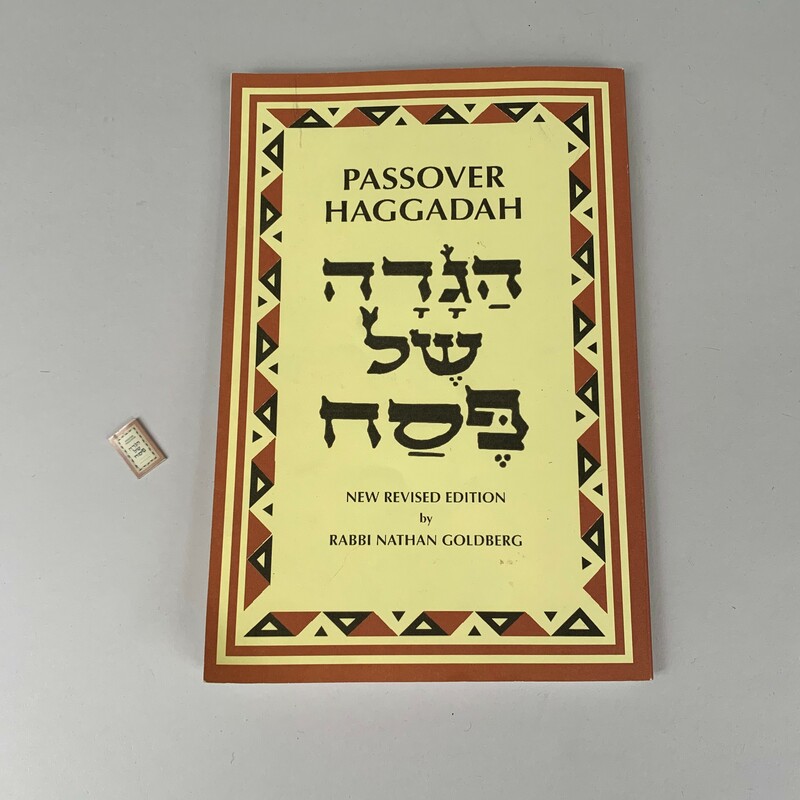 As Jessie looked at the each detail, she noticed that the same Haggadah (Seder Service book) that lives on the dollhouse Seder table, one at each place, is the exact replica of the Haggadah for her own family’s Seder table. No detail was too small to duplicate in miniature. 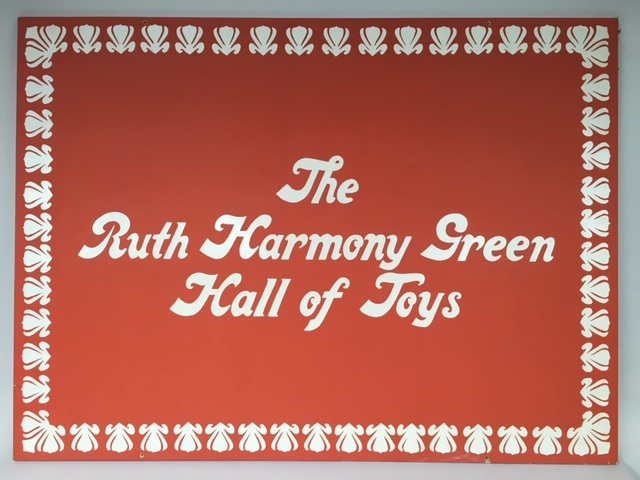 While the “Dollhouse Exhibit” – The Ruth Harmony Green Hall of Toys – is no longer a permanent exhibit here at the Children’s Museum, this is just one of the many memories that it sparked. I can’t wait to hear your BCM collection story. Share it with us over on Instagram @bcmcollections, we’d love to hear it! Our deepest condolences go out to the families of the victims of the attack on the Tree of Life Synagogue this past weekend. This terrible crime is an attack on all of us and we send our love and support to the community of Squirrel Hill and the entire city of Pittsburgh. This latest tragedy is a reminder of how important it is to help all children cope and find comfort in difficult times. When tragic events happen in the world, especially in places that relate to you, it can often be difficult to cope with these events. Parents and anyone who works closely with children have to figure out what to tell their children. I wish there was no such thing as tragedy in the world – but unfortunately, bad things happen, and we need to be prepared for them. It’s official—the digital age is getting younger. This revelation is far from shocking. After all, iPhones have long been parents’ last line of defense against restless toddlers to the point where big-name companies like Fisher Price and LeapFrog now offer their own replicas. According to a recent study by Common Sense Media, kids as young as two are already clocking in an average of two and a half hours of daily screen time. But amid this ever-shifting technological landscape, how can parents hope to keep up? What steps can we take to ensure today’s media trends do not become tomorrow’s pre-programmed addictions? Enter Dr. Seeta Pai. Executive Director of Education at WGBH and former Vice President at Common Sense Media, Dr. Pai has devoted her extensive research career to exploring children’s use of technology. Boston Children’s Museum is pleased to welcome Dr. Pai for Children and Media Usage: Trends and Tips, a special Lunch & Learn event, designed to help families navigate the pitfalls of adolescence and offer advice from leading experts in the field. Join us November 2nd to hear Dr. Pai share her knowledge and convene a conversation around concerns and best practices for digital media with young children. Throughout its history, our nation has not only persevered in the face of challenges, but in most cases has triumphed over them. From the revolution for independence, to the Civil War, to the two world wars, and to the struggle for civil rights for all, we have often waved the torch of the American faith in individual freedom as a beacon to the world. We have prevailed over many threats to our democracy and having been the singular super power for the past twenty-eight years, the United States has used its power on many occasions to help those in need around the globe. Hence it is shocking to see scenes of hundreds and hundreds of children inhumanely separated from their parents and held in detention centers at our borders – scenes that were historically witnessed in particularly cruel dictatorial regimes elsewhere in the world that we fought and overcame. Is this the same America that has led the world in achieving many rights and freedoms of the individual for the last hundred years? The right to life, liberty and the pursuit of happiness applies to all. Almost every one of us is here because of the words on the pedestal of the Statue of Liberty “Send these, the homeless, the tempest-tossed to me, I lift my lamp beside the golden door!” Regardless of the challenges and the need to protect and support the physical and economic security of all Americans, the recent enforcement undertaken by the current administration is nothing short of cruel and unusual punishment. This lowers our esteem in the eyes of not only the families who are the target of this unnecessary action, but also our allies, and distressingly, our own. 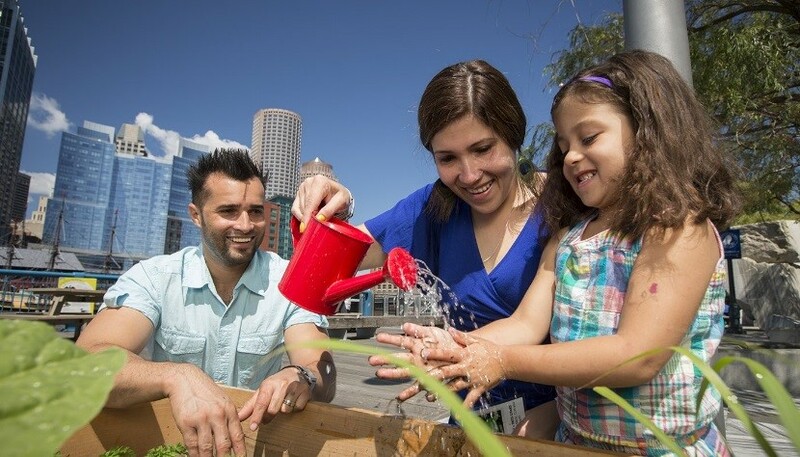 Boston Children’s Museum stands resolute in its support for the well-being of ALL children in the United States and around the globe. We unanimously reject inhumane treatment of any person anywhere. We welcome the involvement of all cultural and educational institutions, businesses and citizens to implore and demand that our lawmakers act immediately to reverse the current injustice. This blog post was written by Health and Wellness intern, Deanna Gouvia. She is a graduate student from Wheelock College pursuing a degree in Child Life. Every year at Boston Children’s Museum, the Health and Wellness intern puts together a special community project called Message in a Milk Bottle. This year, I had the opportunity to design, coordinate, and facilitate the activity with visitors at Boston Children’s Museum as well as children and adults at Boston College Campus School, Franciscan Children’s, and Shriners Hospital for Children. I titled my activity “Building Community Connections” to emphasize the idea that we all have people who are important to us and whether we live near or far, or cannot always be together, we are still connected as one community and we can work together to create a collaborative piece of art. The goals of this activity were to promote community engagement throughout local organizations, to encourage social and emotional development by thinking about social relationships and the importance of those people, and to enhance interactions between people of different ages, gender, cultures, abilities, and locations. During March and April, I visited Shriners Hospital for Children and Franciscan Children’s to facilitate the activity. Materials were provided for Boston College Campus School staff to do the activity in their different classrooms. Each participant was asked to think of one or more people who were important to them and create a piece of art that represented those important people using a variety of craft materials that were accessible to people with different interests and abilities. 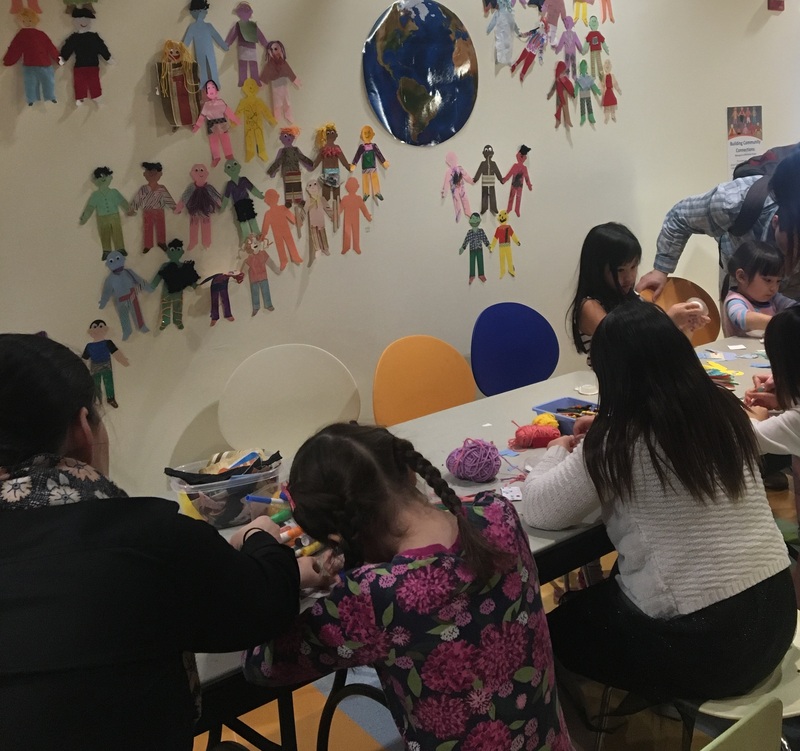 The activity was then duplicated at Boston Children’s Museum during April’s Morningstar Access program and again during regular operating hours on April 22nd. During the creation process some wonderful conversations and illustrations about community and important people took place. At Shriners, one child decorated a person as her favorite nurse who helped her throughout her medical experiences starting when she first went to Shriners. Another child at Boston Children’s Museum commented that her father was her important person because he “tucked her in and [they] did fun things together and [he] loved her”. At Franciscan, a family group of a mother, a teenage boy, and a toddler girl worked together to create their own family piece to contribute. At the Campus School, each classroom completed the activity to contribute their pieces to the overall display, which created a sense of community at the school. There were people of different ages, abilities, and languages working together which really illustrated the idea of community connectedness despite differences. At the Museum I was very encouraged to see a great deal of inter-visitor interactions. Children and adults alike, were conversing about their important people, working together to find desired materials, and complimenting and commenting on each other’s art. I was also happy with the number of adults who participated, making their own important people, connecting their art with their children, and encouraging conversations about community and how we are all connected. The art gathered from the local organizations as well as from the Museum were collected and installed on display in The Common at Boston Children’s Museum on April 22nd. 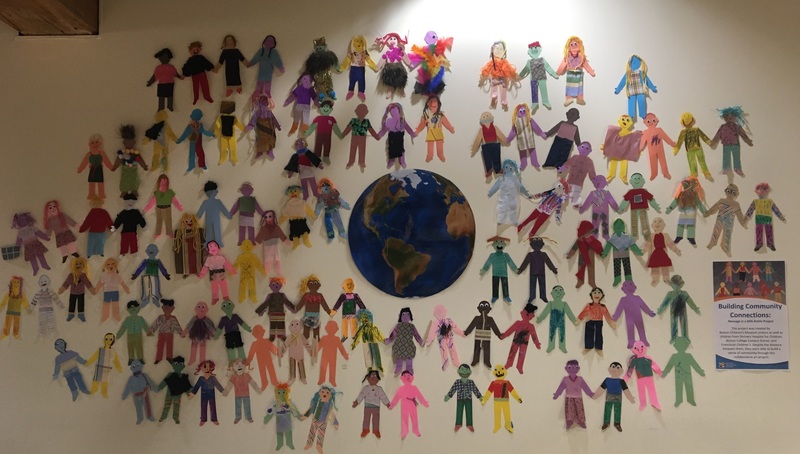 Despite the distance between the children and adults in the hospitals and Campus School, and the visitors at Boston Children’s Museum, they were each able to contribute a piece of art that was important to them, to a greater collaborative piece of art that signified community, near or far, as represented by the people centering around the Earth. The display will remain until I complete my internship on May 4th. Being responsible for this project from start to finish allowed me as an intern to develop skills I otherwise would not have. I had the opportunity to take on a strong leadership role as I coordinated with staff members at other organizations and facilitated the activity in the various settings. By completing this project I have also learned how much work, effort, time, and collaboration goes into putting together an activity of this scale. It is certainly an experience I am very proud to have had and one that will continue to influence my work as I continue on in the field of child life. 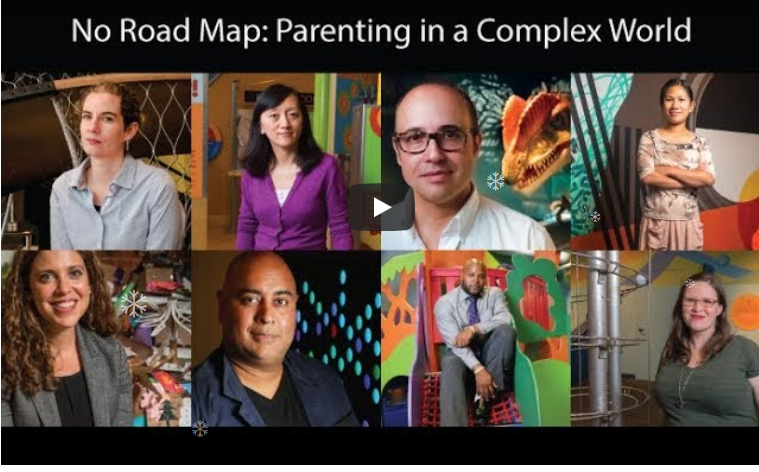 In a recent video produced by Boston Children’s Museum, we explored parents’ concerns about the challenges of parenting in a fast-changing, complex world. Many of the parents expressed concern about their children’s social media usage. Of course, we want our children to be fully fluent with the technology they will have to utilize in our increasingly high-tech world, but does that include social media? 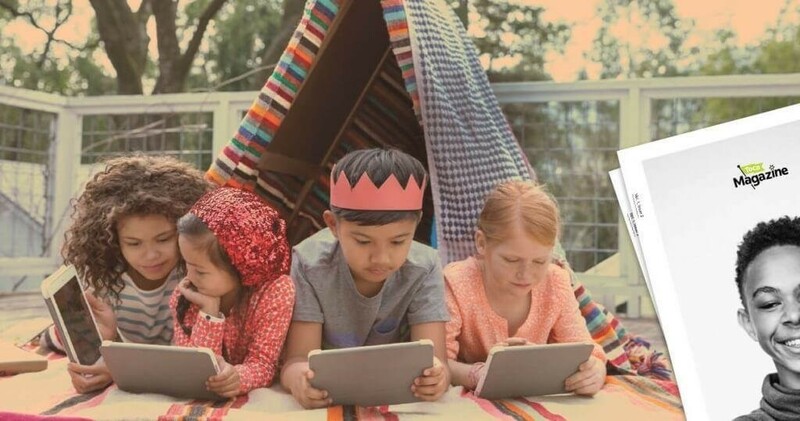 While understanding that technology is a very important learning tool, we must also acknowledge the dangers of enabling our young kids to socialize online before they have practiced developing and maintaining real friendships and before they have explored their own identity and developed some resilience and maturity. Parents are worried about their kids spending too much time on screens, feeling left out by their friends online or, even worse, being cyber-bullied. We worry that they may be enticed to grow up too fast, or take on an identity that is not their own in order to belong. We worry about their privacy and safety in a realm we cannot control. All these are issues that are very important to be aware of, to monitor, and to feel empowered to address. We need to rigorously protect our kids’ privacy and monitor their interactions on the web. Now, we also need to protect their data, which has become a very valuable commodity. Think about it – the habits of our daily lives – what we buy, what we care about, what we do with our time – are collected, analyzed, quantified and sold to eager marketers who use our information for a multitude of purposes. This is a fact of modern life that, to some extent, we have come to accept. But what about our children’s information? In a Washington Post article of May 16th, Valerie Strauss states, “Whether you know it or not, there is a remarkable amount of personal information about children now being collected by schools and their vendors that is then shared with government agencies, for-profit companies and other entities, all without parent consent.” This information goes beyond a child’s name, address and age. It can include their test scores, health data, medical records, grades and even what they had for lunch in school. The information is often stored “in the cloud,” offering access in a realm that is very new and not carefully regulated. Several years ago, Leonie Haimson and Rachael Stickland, raised the alarm and started the Parent Coalition for Student Privacy along with the Campaign for a Commercial-Free Childhood. Their important work is laid out in Strauss’s article. Their work led to the creation of the Parent Toolkit for Student Privacy, an indispensable collection of information and tips about how to ensure your child’s data privacy is protected at school. As parents, we need to resist the pressure on our kids to live many hours of the day on online. We can say no, or even “not now.” As hard as it is to resist their pleas to join in with their friends, it is harder to undo the harm that may be done by hurtful, and very public, social interactions. Of course, it is up to each individual parent to find their own path and there is no road map, which is the title of our video that I hope you will enjoy watching. Please let me know what your thoughts are on this tricky topic and let’s continue the conversation! It’s October and that means Halloween – costumes, candy, pumpkins, parties. It can be an exciting time for families to play together and be creative. It can also be stressful, balancing expectations, deciding on costumes, and maintaining a healthy diet. Two previous posts on the Power of Play blog offer thoughtful tips for navigating the Halloween season and are worth a first read, or a second look. Happy Healthy Halloween by Saki Iwamoto suggests ways to turn Halloween challenges into fun learning opportunities. Note: In 2017, we will celebrate Halloween in simple ways at Boston Children’s Museum, starting with a Monster Mash KidsJam dance party on Friday October 27, and continuing with activities such as mask making and pumpkin explorations through October 31. Indigenous Halloween Costumes: Empowering or Problematic written by Sara Tess Neumann and Meghan Evans tackles the complicated topic of costumes and cultural respect. Note: The Native Voices traveling exhibit referred to in this post is no longer at Boston Children’s Museum. From the outside, it looks like an ordinary day at Boston Children’s Museum. Families and local working folks are having lunch, kids are chasing the pigeons, people are texting friends to make plans for tonight. Inside the museum, kids and families enjoy the exhibits—blowing bubbles, exploring the Japanese House, creating art. But if you were to take a peek behind the secret doors, you’d spy a very different scene. 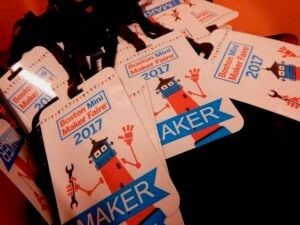 Boston Mini Maker Faire 2017 is just a few days away, and everyone on Boston Children’s Museum staff is getting ready. 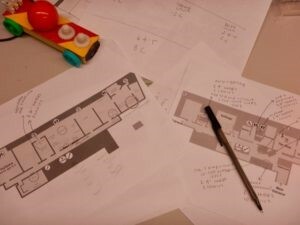 In one room, the Production Team looks over the site plan. They’re putting the finishing touches on the map and figuring out exactly where each Maker is going to go. Some Makers need to be inside and some need to be outside; some need a lot of space; some need electricity; some need access to a water faucet. The team is also working on placement of food trucks, water fountains, dining tables and Port-a-Potties. It’s a lot to manage. In another room, staff are stringing together lanyards. Every Maker will get one. Nearby, other staff are sorting out the materials needed for the Museum’s own booth at the Faire: the Nerdy Derby, the Human Paint Roller, and Scribblebots. Upstairs, people are sorting the materials that have been gathered for the Take Something booth, where visitors will be able to pick up all kind of materials and gadgets to take home for their own maker projects! In other places, ticket sales are coming in, emails are being sent, phone calls are being made. The staff managers are figuring out a schedule for Sunday. Staff will need to cover the Admissions table and the Information Tent (and the Info Desk inside), as well as assist Makers pack in and out, help visitors find their way around, reunite families who have gotten disconnected from each other, check tickets, as well as staff usual Museum exhibits. In addition, the staff will be joined by about 40 volunteers. Scheduling all those people into all those locations is a gargantuan task. The staff managers are sure to drink a lot of coffee while they work it all out. The Facilities Team is making sure we have all the tents, tables, chairs, signs, stanchions and everything else we’ll need on site on Sunday. With nearly 100 Makers coming, it’s important that we make sure they all have what they need to have a successful day. There’s a Plan B in case of bad weather. 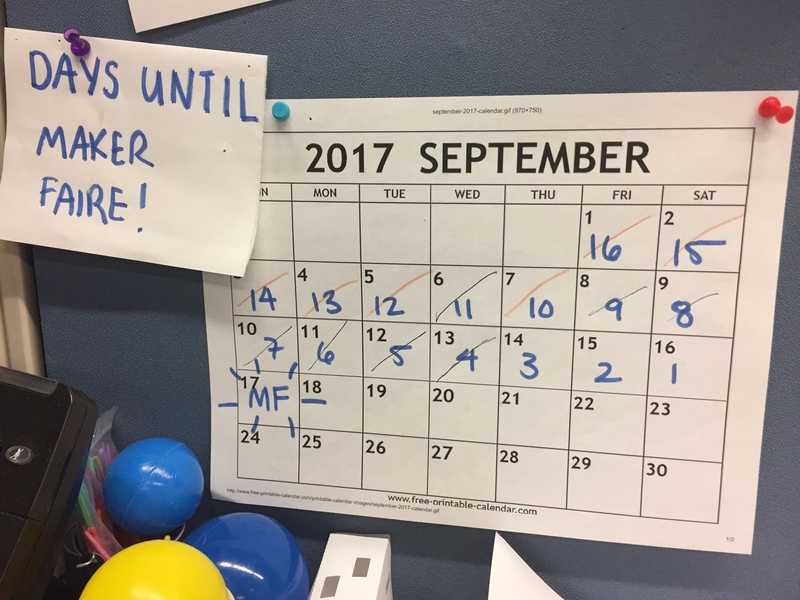 We’ve been monitoring the forecast closely for the last week, fingers crossed. As of right now, it’s looking pretty good. Behind the scenes at Boston Children’s Museum is abuzz with all kinds of activity to make sure this Sunday’s Maker Faire will be a grand success. It will all be worth it when the crowds arrive on Sunday morning discover the joy of creating, innovating, inventing and….Making! You can still buy tickets here! We can’t wait to see you! Today was a momentous day, as Bill, Denise, Jane and Henry Richard, Governor Charlie Baker, Mayor Martin Walsh and others, broke ground on Martin’s Park; soon to be a world-class, accessible City of Boston park and playground in the “back yard” of our Museum on Fort Point Channel. This park, dedicated to Martin Richard, the youngest victim of the Boston Marathon bombing, will be a symbol of all that is good in us – strength, resilience, love and fellowship. Martin’s vision of peace is the inspiration for this visionary place where all children and their families will play, have fun, and learn for years to come. And we need Martins’ vision now, more than ever! In recent months, we have seen our civic discourse become increasingly divisive and destructive. While we, as Americans, may have views as diverse as our origins, we must all agree on one thing: hate and bigotry have no place in our society and we must do everything we can to stop it. In this context, the groundbreaking of Martin’s Park takes on a greater importance and urgency. For this park will be a symbol of peace and inclusiveness that reflects the noble aspirations of a family and a community. It will forever inspire us to make a better world, a world in which every child can experience the exhilarating joy of play, discovery, and friendship. A park that will be a symbol for all, of the light and love that can emerge from darkness. Edith Wharton once said, “There are two ways of spreading light: to be the candle, or the mirror that reflects it.” Therefore this park will be, for all time, the brightly shimmering candle reflected in the mirror of thousands of children’s shining faces. Please join me in celebrating this historic ground-breaking and its urgent message of peace and hope for our city, our state and our country. Healthy Food Fun at Fresh Fridays! Do you like eating fresh fruits and vegetables? If you do, that’s great, but don’t worry even if fruits and vegetables are not your or your child’s favorite. There are many ways to interact with fresh produce beyond just eating it!